How long do you need to set aside to complete the Anthem campaign? 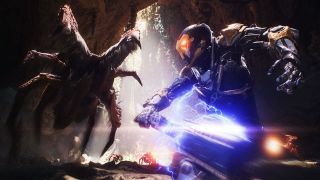 With so much negativity surrounding BioWare's latest venture, you may well be wondering exactly how long is Anthem? How long are you going to be putting into this futuristic space adventure with all the mechs? Well, it's a tricky question really, because like other games in the same genre like Destiny, it's not just a case of beating the game and you're done. There's end game content and more to explore beyond that. But, if you're wondering how long is Anthem in terms of the main game, then we've got some stats for you. It's taken me around the 20 hours mark to work my way through, which includes time to find those pesky Anthem treasure chests, faff around with other members of the GamesRadar team and do as many side missions as humanly possible, so that may well skew the numbers somewhat. But, just to make sure, I've been chatting to the guys over on our sister site, PC Gamer, to see how long they've taken to smash through Anthem's campaign. Well, PC Gamer's Tom Senior took a very specific 23 hours to complete Anthem, or that's according to his Origin counter anyway. Plus, he played the second half of the game on hard mode, and took time out to potter around in freeroam with some pals too. Then there's PCG's James Davenport, who's also reporting a clock time of 20 hours. But, Steve Messner, who's reviewing it for PC Gamer said it's taken him 34 hours to reach level 30, the current Anthem level cap, and around 30 hours to complete all the story-led activities in the game. So, if you're thinking of buying Anthem, or subscribing to EA Origin to play it, you should basically think of it as a roughly 25 hour campaign investment, with more to come if you're interested in endgame content. For now, check out our Anthem review in progress to check out what we think of the game, and stay tuned for more impressions still to come.